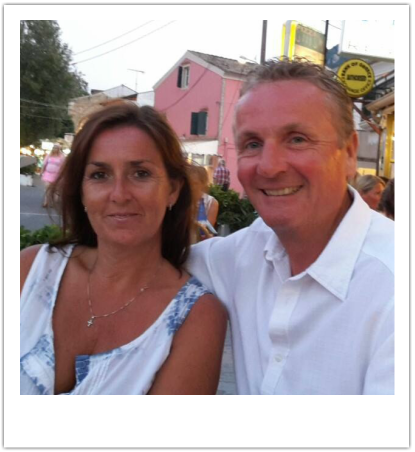 We are Jane & Chris Sharpe who own 'Prestige Villas of Corfu'. We are dedicated to delivering superior service and unparalleled attention to detail on behalf of our owners. We maintain and rent a select number of homes to ensure a personalised service that exceeds our guests’ expectations. Prestige Villa Management evolved from owning a holiday villa on the island of Corfu some years ago, and in those days it was difficult to find anybody to look after the house in our absence. Prestige Villas of Corfu (Management) is one of the islands largest Villa Management Companies offering a comprehensive service including Housekeeping, Laundry Services, Key Holder, Pool & Garden Maintenance to full renovations and project management. Our Villa Rentals company was born in 2008 following a small number of our owners asking us for advice on renting and marketing their villas. We now have a portfolio of almost one hundred villas including our very own 'Villa Lentzos' in Agios Gordios where it all began many years ago and more recently our family home 'Blue Waters' which since 2017 is available to rent. Jane has over thirty five years experience in the Travel Industry, before relocating to Corfu, for twenty years she had previously been a Director of one of Cheshire's largest retail Travel Agents. Chris has more than twenty four years knowledge of the island and it's villas, having been established here since 1994. Between us we have three children, Andreas, Annabelle & Mikey as well as a menagerie of animals. Annabelle is now working in the office, being fluent in Greek and with her knowledge of all our properties she has become an invaluable member of the team. We take the time to listen and familiarise ourselves with your individual preferences and specific requirements, ensuring a quality of service that is second to none. We know our homes intimately and are happy to give you any information you require to ensure that the villa you choose is the right one for you. Both ourselves and our overseas team of staff are available at any time during your stay.